War Diaz will have to wait. On Saturday night, as the UFC on FOX headliners began their walk-ins into the arena, UFC president Dana White had some other business to attend to. Behind closed doors, he met with a fighter who is among the most talked-about stars in the sport. It was Nick Diaz. White had an offer for Stockton’s finest, one which included a match that he expected him to be interested in, a rematch with Carlos Condit. After speaking however, the mercurial welterweight was not interested. Diaz turned down the offer, White said during the event’s post-fight press conference. Diaz has been in semi-retirement since losing to Georges St-Pierre at UFC 158 in March. Since then, he has said he would only return for a "big" fight, but hasn’t specified what exactly that entailed, although he would clearly consider a title shot worthy of his time. In this business, you better be interested in fighting or you don’t belong here. Hendricks and Lawler will fight for the vacant championship at UFC 171 in March. In effect, White offered Diaz a chance to jumpstart his pursuit of that title opportunity by taking on an opponent who is far ahead of him in the rankings. With the indefinite hiatus taken by Georges St-Pierre, Condit is ranked No. 2 behind Hendricks. Diaz is tenth. Although White didn’t say it, it is believed the Diaz-Condit bout would have taken place on the same night as Hendricks-Lawler. White said that Condit had immediately accepted the offer when it was presented to him. 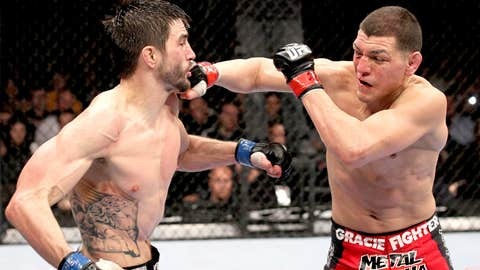 Condit and Diaz first fought in Feb. 2012, at UFC 143, with Condit winning a unanimous decision in one of the year’s most disputed results. Diaz left the arena angered by both the judges’ scorecards and Condit’s strategic execution. It’s quite possible that the lingering resentment of that evening played a role in his decision, but with Diaz, who knows? He went on to tell White he might return around May.